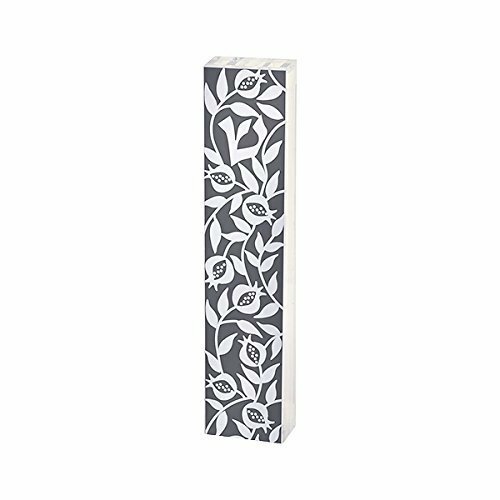 This beautiful acrylic perspex Mezuzah case features an elegant pomegranate design with a clear perspex base. The pomegranate has been grown for thousands of years in the Mediterranean region, and is referenced throughout the Bible as one of the 7 species native to the Land of Israel. In addition, the pomegranate has some of the deepest and richest symbolism in Judaism as its many seeds symbolize the abundance of righteousness, prosperity and wisdom. A beautiful blending of tradition and modern art that transforms this iconic Jewish symbol into a stylish decoration for the entrance way of any home, room or office. Dorit is a renown Judaica designer from Israel. Her integration of tools and technique of computerized graphic art with Jewish texts and traditional paper cuts, along with the interesting combination of materials and a unique mix of hues and shapes have all joined together to create a distinctive traditional modern Jewish art. If you have any questions about this product by Dorit Judaica, contact us by completing and submitting the form below. If you are looking for a specif part number, please include it with your message.